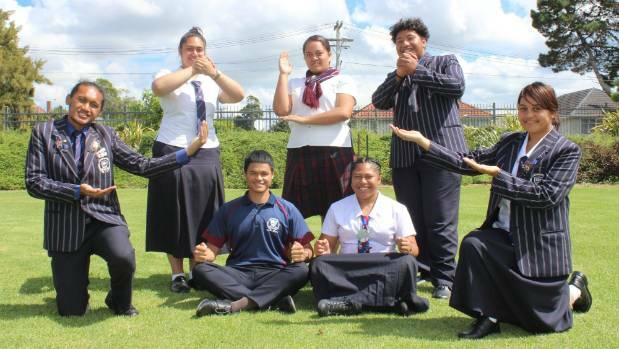 An Auckland school is ready to take on the stages of ASB Polyfest this week – but the experience goes beyond dancing. This year Tamaki College has a kapa haka group, a Tongan group, a Niuean group and a Samoan group competing at this year’s Polyfest. It also has students who will compete in the speech competition. Polyfest began in 1976 as a way for students to show pride in their cultural identity and heritage, and to meet other students from different schools. It was exciting for Tu’uga Stevenson to be a part of the journey for all four groups, he said. “For the students Polyfest is a privilege,” Tu’uga Stevenson said. Female leader of the school’s kapa haka group Alarzae Kapea-Tai said she was “excited and nervous”. “We’re representing our culture, family and school,” Kapea-Tai said. Niuean group leaders Suzie Toloa and Tau Haffeiki looked after a group of 30. “It’s stressful but good at the same time,” Haffeiki said. Haffeiki was looking forward to seeing the audience’s reaction when they performed, he said. “It’s the last time we’ll be on stage so we’re going to go hard out,” Toloa said. Students Jay’Lee Nouata and Gustavo Pohatu are the leaders of Tamaki College’s Samoan 60-member group. “We have different people from different cultures in our group so the actions and language can be hard for them,” Nouata said. “It’s good to see them become familiar with the actions and words, and see their confidence get a boost,” she said. Pohatu said he was proud to be part of the Samoan group and hoped their performance would show older generations that traditions were still being passed down. The group had 83 members and was the school’s largest group. ​Pau’uvale said the boys’ dance was more of a workout than a dance as there was lots of jumping and leg work. He was really excited to perform and eat food at Polyfest, Pau’uvale said. Initially the Tongan group’s challenge was to move and work as one, Laimani said. “We’re nearly close to what we want,” she said. Laimani was looking forward to performing their “hearts out” and “expressing ourselves,” she said. About 10,000 students are set to perform at this year’s Polyfest which takes place from March 14 to March 17 at Manukau Sports Bowl.